Okay, here it is – my belated (but better than be-nevered!) New Year, New Game post. 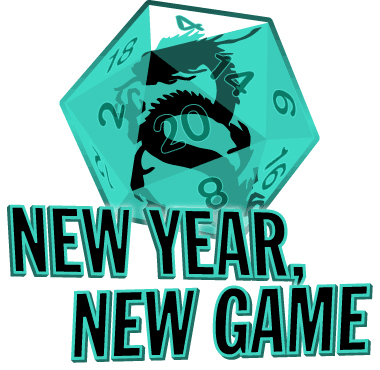 For those of you just joining us, New Year New Game is a challenge to roleplaying enthusiasts to try a new roleplaying game every new year, to help inspire us, broaden our horizons, and keep our hobby from getting stale. 1) Macabre Tales (link) – I reviewed this one a little while ago – It’s a one-on-one RPG (one narrator, one player) that is the most faithful tribute to the stories of H.P. Lovecraft that I’ve ever seen, and it uses dominoes instead of dice. Very intriguing. 2) Toypocalypse (link) – This is another that I reviewed recently. One could call it a mash-up of Toy Story, Small Soldiers, 9, and Lord of the Flies, if one were so inclined – sentient toys living in a human-free post-apocalyptic world. Oh yeah, I’m so there. 4) Fiasco (link) – Nope, I haven’t played it yet. Yeah, I know it’s awesome. I kn… I KNOW, ALL RIGHT? I KNOW! I’M GONNA! JUST STOP, ALREADY! So there’s my list. If I get to play and/or run one of them, I will consider it a success. Two will be a critical success, three will be an outright miracle. I’ll check back in when January 2013 rolls around and file my report. Mr. Hudson is a long-time friend of my partner Paula and mine. I used to call him “Dave” (that’s his first name) until the day I bumped into him while visiting a grade school and learned that he was a teacher there. Now I call him Mr. Hudson. Anyway, Mr. Hudson and I got into a conversation late last year in which he mentioned that his son expressed an interest in playing Dungeons & Dragons – so I told him that if he would like, I would be happy to run a game for him and his son someday. He said he would like. So I’m going to. I’ll probably run a retroclone like OSRIC, which while technically counts as D&D, I’ve never run before. So it’ll count as a new game! Jeremy is my oldest daughter’s boyfriend. He already enjoys console RPGs, so trying out a tabletop version won’t be all that new to him. During one of their phone conversations, I overheard my daughter say to him “You’ve never played Dungeons & Dragons? You can’t truly call yourself a geek until you’ve played D&D! My dad can run a game for us someday!” He has agreed to do so – but it’s likely that his real agenda is to have that much more face-to-face time with my daughter. Regardless, I’m making him chuck some dice, probably in the same Blue Rose game with Allie. My friend Chris is someone I’ve gamed with for years, who recently told me that one of his other friends (whose name I cannot remember right now) inquired about giving the Call of Cthulhu RPG a try for the first time. “There’s only one guy I know who can do Cthulhu justice,” says my friend Chris. (Aw, shucks.) Now this doesn’t really count as a new game on my end, but it would on his! Ca-ching! And there we have it – my big RPG plans for the year. Check back with me in 2013 to see how they went! 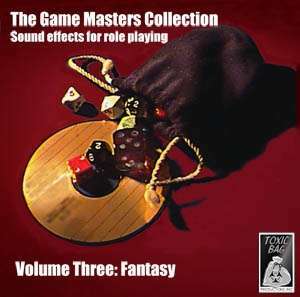 Many gamemasters, myself included, like to spice up their roleplaying sessions with background music and sound effects. I’ve been finding quite a few examples of both in the bricked-up library, so I thought I would put them into a big pile, give them all a listen, and share my reviews for anyone who might find them useful for their games. 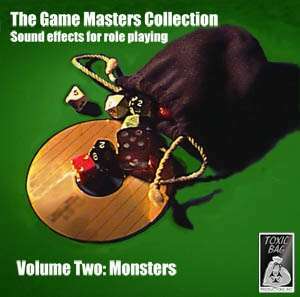 Toxic Bag’s Game Masters Collection is a series of sound effects arranged in several themed volumes. I’m going to tackle the first three in this post, and cover the rest in future posts. 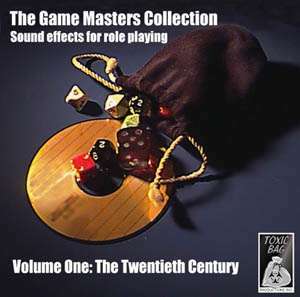 Volume One: The Twentieth Century is a collection of ambient sound tracks and individual sound effects for contemporary RPGs. The ambient sound tracks are full and rich – “1930s/40s Swing Club” features three minutes of crowd noise and jazz music, with laughing patrons, clinking glasses, and cigarette girls in the foreground. The “1950s Corner Gin Joint” track features the sounds of a pool match, a radio broadcast of a baseball game, and some background conversation, and the 1960s Go-Go Club, 1970s Disco, and 1990s Industrial Bar are just as full and rich. Each track clocks in at around three minutes. Other goodies in this set include: a noisy, staticy morse code message (I’m tempted to try to translate it), calm and panicked distress calls with lots of dropouts and static, an emergency broadcast message announcing the declaration of martial law (thousands of uses! ), an evil genius headquarters and mad scientist lab, a cave, a sewer, a couple of different cities, and several different types of gunfire. Most tracks seem to run around a minute and a half long, with the ambient tracks running closer to three minutes, and the sound effects (like gunfire) clocking in at less than half a minute. Some of the background tracks don’t work quite as well when looped. The Swing Club track, for example, fades in as the house band is in the middle of a song, and fades out the same way. I feel this track might have worked better if it were a bit longer, and included three complete songs (that would make the track seem less repetitious to the players if their characters are spending a lot of time in that particular scene). Some of the other tracks have a long period of silence after the fadeout, which would create a noticeable hole in the effects if it was being looped. This could be somewhat remedied by playing the tracks more quietly (at the risk of losing some of the nuances), or more technically adept gamemasters could use an audio editing program to remove the silence and make their own extended versions of the tracks. All in all, it’s a quality package for a reasonable price. Volume Two: Monsters is a collection of sixty three creature sounds and noises ranging from bugs, cats, and snakes to aliens, undead, sea monsters, and demons. Many of the effects here are very easy to repurpose. 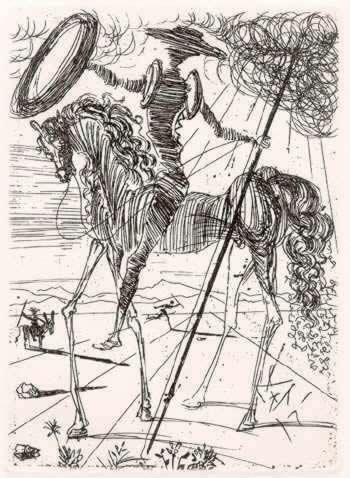 The Dimensional Beast, for example, could easily be used as a malfunctioning robot or distorted radio message, if you don’t happen to have a place for a Dimensional Beast in your scenario, and anyone with access to some audio editing software and even a modicum of skill could combine two or more of these tracks into something perfectly suited for their needs. Most of the tracks run less than thirty seconds, with some of the more simple sound effects clocking in at between :10 and :15. Some of the effects are a bit campy, but intentionally so (such as the “Polly Playtime” doll and one of the zombie tracks) which means that GMs looking for humorous and/or cheesy sound effects will find something of use here as well. Volume Three: Fantasy features – you guessed it – fantasy themed sound effects and ambient background effects. This collection boasts fifty six tracks, with over a third of them battle themed – arrow hits and flybys, sword draws and clashes, and outdoor and dungeon skirmishes. Other audio goodies include a royal fanfare, some orcs grunting and talking, a bit of gregorian chant (with some nice reverb effect to make it sound like it’s happening in a monastery), a church service, a few spells being cast and some dragon noises, to name a few – all of which could find a place in any good fantasy campaign. As with the other volumes in this series, the ambient tracks (like the Busy City, Smithy, and Enchanted Forest) suffer from long stretches of silence at the end, which isn’t a problem when the tracks are played once, but will create a noticeable hole in the sound if they are looped during longer scenes in the game. This could be resolved by playing the sounds at a lower level, or using an audio program to trim out the silence and maybe even extend the entire duration of the file through cutting and pasting. That’s it for this batch. Keep your ears peeled for my next batch of RPG music and sound effects! 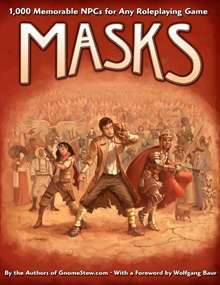 I’m not sure how I missed this on Gnome Stew when it was first posted, but I’m glad I caught it through a more recent post – John Arcadian explains The 3-3-3 Approach to Quick Game Prep. It sort of reminds me of Dr. Rotwang!’s Adventure Funnel, another great tool for prepping adventures quickly. Both are awesome, and you should definitely print them out and put them in your RPG binder for future reference, as I have done. Some thoughts about this thing we do. Just a little while ago, Wizards of the Coast announced a new edition of Dungeons & Dragons – news that was even leaked early at the New York Times – and as you’d expect, gamers have a lot to say. Most of it isn’t very hopeful, at least from what I’ve seen. I had a much longer post written about the whole thing, but after I looked it over, I realized that I wasn’t saying anything that anyone didn’t already understand, and I was really just writing a sermon for those folks in the pretty robes over there near the organist. So I’ll just go over my general opinions and be done with it. Companies like Hasbro have to make money. The problem with roleplaying games like Dungeons & Dragons is that it’s very possible to enjoy them for years without spending any more money on them – and from a corporate standpoint, that’s bad. So they have to find some way to keep people spending money. On top of that, the roleplaying hobby faces a pretty bleak future. Technology threatens a pretty nasty flanking attack – on one side with multiplayer video games that become more immersive every year, and on the other with the impending death of print and smartphone apps that replace dice and possibly even miniatures, a combination which may make one wonder why they shouldn’t just avoid all of this trouble and play an MMORPG instead. Hasbro has to do something to keep up with this – and if it doesn’t work, then we may eventually see them drop the Dungeons & Dragons name. The thing is, just as there will always be wargamers, storytellers, and amateur actors, there will always be roleplayers. Even if we were to see Hasbro close the doors on D&D completely, there would still be gamers playing every edition ever printed, along with the retroclones that they have inspired. D&D: the business may not work years from now, but D&D: the game always will. It’s happening right now with games that are no longer in print – Star Frontiers and Marvel Super Heroes and all of their supplemental material are available for free online. This is not to mention classic games from other companies – and the new indie games we’ve been seeing lately as well. People will continue to play them, and game designers, writers, and artists will continue to produce them, even when it doesn’t become financially feasible anymore. So don’t get all caught up in edition wars and all that mess. Play what you enjoy, find others who want to do the same, and have some excellent adventures. WyshMaykers is a storytelling game about a special group of people who have the power to make wishes (sorry… “Wyshes”) come true. The setting is rather open-ended – no time period is implied (though it seems to assume a contemporary one), so GMs could set their stories in almost any era they liked. Virtually no mention is given to the repercussions of this wanton WyshMayking. Do Wyshes cause any kind of karmic backlash? Are WyshMaykers only allowed to make Wyshes when the mundanes aren’t looking? If not, what would happen if a mundane witnessed a Wysh in action? None of these questions are answered, but the right group of players may have a good time making up their own. The game uses -U-, a fairly rules-lite system. Characters are detailed by three Attributes (Action, Thought, and X, which is sort of a catch-all attribute for things such as Will and Luck), a list of Studies (areas In which they have some level of expertise), and any Items that they possess. To create a character, players assign dots to these Attributes, Studies, and Items. Actions are resolved by rolling 3d6 for each dot in the appropriate Attribute (plus any dots in related Studies and/or Items). If any of the 3d6 rolls come up with a pair of matching numbers, the action is a success, while three matching numbers indicate a critical success. No matches denotes failure. It’s a very freeform system – possibly too much so. The Wyshing ability allows a character to do pretty much anything they desire, with little in the way of limitation (a table of modifiers makes larger acts of Wyshing more difficult, but at the very worst, there’s still a 1 in 36 chance that a WyshMayker can topple a skyscraper). There is a large and powerful group – the Society of WyshMaykers – who work to keep any such activity in check, but even with them in place, I fear for any gamemaster who ends up with even a single powergamer in their group. Please choose your players responsibly if you decide to run a session of WyshMaykers. The artwork is rough and sort of “scratchy,” and leaves a bit to be desired – thankfully, it is somewhat sparse and non-distracting. The crumpled paper background for the “World of WyshMaykers” section makes it a little more difficult to read, but is absent in the print version of the document. WyshMaykers gets bonus points from me for the inclusion of the “Print 2 Play” pages at the end of the book. These include character record sheets, story outline cards, and cards to help players keep track of their points, as well as “Rules-at-a-glance” cards. These cards contain a simple synopsis of the rules so that the Story Referee and players can check them quickly, without having to reference the rulebook. They even have the page arranged in sections, so you can fold or cut it apart to make it pocket-sized. This is something that I wish every RPG publisher would do with their game (in fact, for those that don’t, I usually end up making one myself, the first time I run the game). 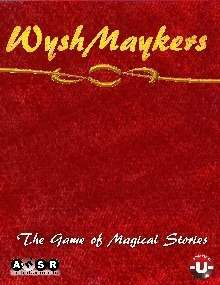 Check out WyshMaykers: The Game of Magical Stories at DriveThruRPG.